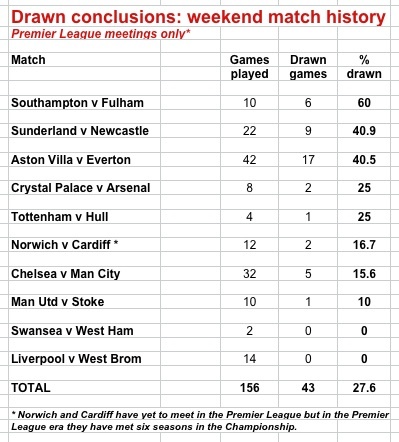 A review by Sportingintelligence of all 8,306 games played in the 21 years and a few months of the Premier League shows that 2,232 of them have been draws, which is 26.9 per cent, with Norwich the club with the highest percentage of stalemates (of current clubs), and Manchester United with fewest. Here is the all-time draws table. 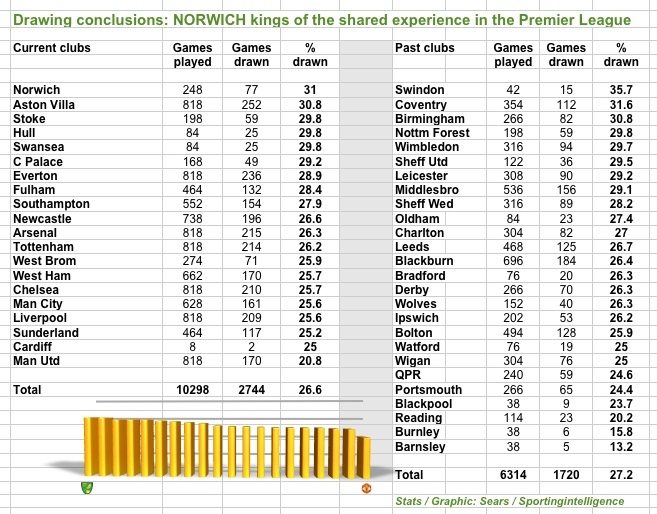 Norwich have played 248 Premier League games, drawing 77 of them, or 31 per cent. Of all clubs ever to have played Premier League football only Swindon (35.7 draws in their one season) and Coventry (31.6 per cent draws over many years) beat that. An outstanding feature of the draw table of current clubs is Manchester United at the foot of the table with 170 draws from 818 games for a low rate of 20.8 per cent. United have been such a force for years by turning so many draws into wins. Up to the start of this season only 66 of their 170 draws had been played at Old Trafford, a mere 16.3 per cent of the 405 games played there. Hence United’s current concern that as well as the home defeat (to West Brom) there have been two games drawn of the other three Old Trafford games played there. The only three clubs in Premier League history with a lower rate of PL draws were those who drew so few games because they were losing so many: Barnsley, Burnley and Reading. This season so far of the 80 games played 17 have been drawn, which is 21.25 per cent. This weekend’s games offer an intriguing contrast in the history of drawn games between particular clubs, as this next graphic shows. Aston Villa and Everton have shared as many draws in the Premier League (in absolute terms, 17 of them) as any other fixture in Premier League history. Only Tottenham v Arsenal and Tottenham v Chelsea fixtures have seen as many as 17 draws. Villa and Everton have thus drawn 40.5 per cent of their PL meetings. But in percentage terms, other pairings this weekend have higher draw rates as the graphic shows. Southampton versus Fulham in the Premier League has ended drawn on six of 10 occasions (60%) and Sunderland versus Newcastle nine of 22 (for 40.9%). At the other extreme Liverpool and West Brom have the longest record among current clubs without a single drawn game of 14 meetings with no draw. (West Brom have also gone 14 games against Chelsea with no draw). Previous post Arsene Wenger - what is he good for? Next article Is the idea of NFL finally taking off across the Atlantic?